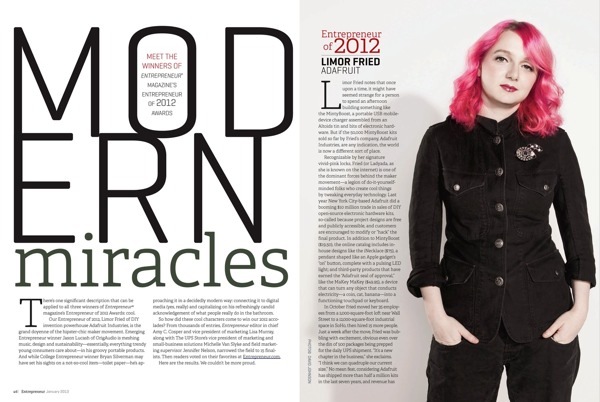 Adafruit’s Ladyada (Limor Fried) named Entrepreneur of the Year by Entrepreneur Magazine @EntMagazine « Adafruit Industries – Makers, hackers, artists, designers and engineers! Ladyada was awarded Entrepreneur of the Year by Entrepreneur Magazine today! Thank you everyone in the maker, open-source, hacker, artist, engineer and designer community who nominated and voted for Ladyada Entrepreneur of the Year, from the beginning of the process, the nomination and the finals, it all took us by surprise. The fantastic folks nominated all have amazing companies, causes and efforts, we’re trilled to be included with them. Thank you! 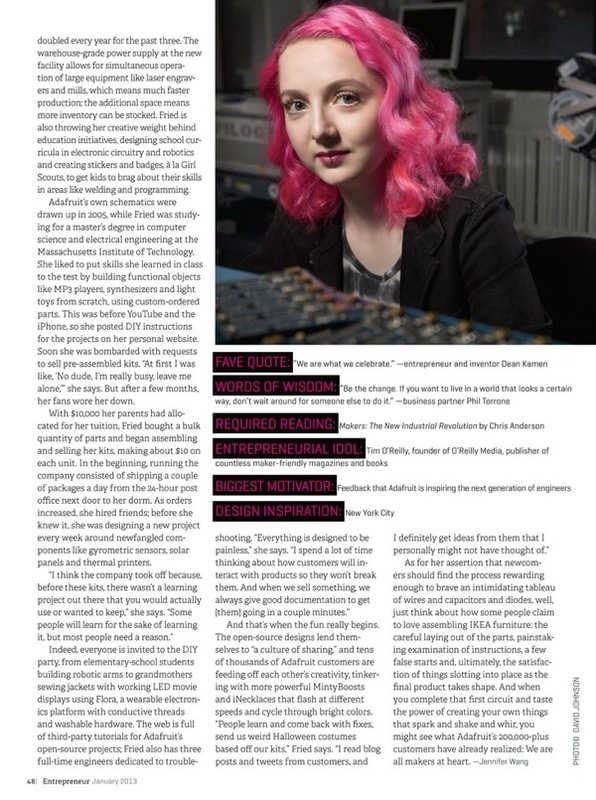 The magazine’s Entrepreneur of 2012, Limor Fried, founded Adafruit Industries in 2005 and through it, is educating and inspiring the next generation of engineers and scientists. The open-source hardware and electronics company not only designs a catalog full of cool tech products that clients can order–it gives away the step-by-step instructions and tutorials for them to learn how to do so themselves. Fried’s new badging system also makes learning exciting for kids, by rewarding them for mastering new tech-savvy skills, and furthers the educational mission of Adafruit Industries. Previous profile here, and here’s a preview of the article January 2013: Feature: Entrepreneur of the Year here. And an interview “Magazine names hacker Limor Fried ‘Entrepreneur of the Year'” on CNET here. With this award comes great expectations and responsibilities for all of us at Adafruit to keep doing a good for our community, customers and for our team. Thank you everyone for all the support. Wow, that’s fantastic! Well done Lady Ada! Never a more well deserved award. Congrats on nailing this award Limor, thanks for sharing, not only your passion for electronics, but for the community, source code, eaglecad files and your creative, entrepreneurial spirit. We are all delighted for you. Brains and beauty: a winning combination. Congratulations! You earned it. Such a great role-model for my girls. I am so pleased to see this. Please take a moment to enjoy this well deserved honor. Congratulations! You are an inspiration to us all. and it says a fair bit that this post has gotten buried in your blog already today. I had to scroll down almost to the end of first page to find it. Great company you built – and keep. Mele Kalikimaka from Maui to NYC! Let your passion and innovation be a shining beacon of light for all the makers, inventors, artists, and future engineers. Very, very cool. A ton of inspiration for new builders, for women, but I think the things you are doing for the youngest generation of builders is the best. Congratulations! Glad to see your hard work recognized.